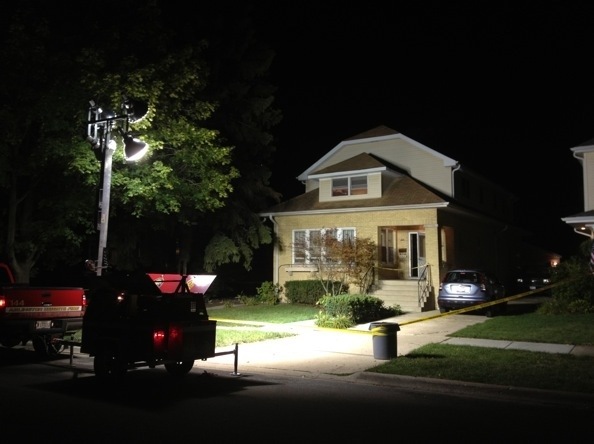 Arlington Heights Fire Department light trailer illuminates the scene while Cook County Bomb Squad investigators, Arlington Heights Police Department arson investigators and Arlington Heights Fire Department fire investigators go to work. Arlington Heights police and firefighter/paramedics responded about 8:44 PM Tuesday to a report of a house fire in the 100 block of South Walnut Avenue. Police arrived first and reported that a male victim was lying in the front yard. Apparently a male resident of the house was working with some type of fireworks or pyrotechnical materials in the basement of the home, and was injured. Light smoke came out of the house after firefighters ventilated the basement windows. Several neighbors gathered near the scene and were concerned about the residents at the house, and were also concerned if there was still an explosion risk. Although an explosion risk was not suspected, the Cook County Bomb Squad was called to the scene to check materials in the house just south of Sigwalt Street on the west side of Walnut Avenue. Firefighter operations during arrival on the scene of a small basement fire, and investigation for hazard detection and the ruling out of criminal activity.